Sounds intriguing I thought and so I emailed straight back to say yes I would be interested. 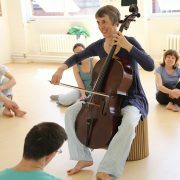 I had no idea what I was letting myself in for but there were the words ‘improvise’ and ‘go with the flow’ in the email, ways of playing which we don’t usually get to explore in ‘normal’ orchestral concerts. After an initial wait for the successful application to ACE for funding our first meeting was on Thursday 29th March at Croydon Youth Theatre, in a wonderful airy and light dance studio. A three hour get-to-know-you session for the main devisers and professional dancers for the project. Well, I haven’t done that before, the best I can manage is a bit of boogying (in my youth) at the local disco, but in for a penny, in for a pound. The Dancing Cellist anyone? So the first meeting brought together our main collaborators – Co-founder Gemma, Dramaturg and Director Louise Katarega, Dancers Vicky Malin and Takeshi Matsumoto. Also joining us a young graduate dancer Sorrel De Paula Hanika. Before the first meeting lots of organising of rehearsals and times, many more rehearsals than we normally get because this was to be a 40-45 minute piece created from scratch called <Insert Title Here>. This was one of the things I valued about the project, the amount of time we had to create and devise. Normally for an orchestral concert we get a 3 hour rehearsal and then we have to perform the concert. Just time to play through the notes a couple of times, rehearse a few corners and then perform. So this, for me, was rehearsal luxury. Although creating, rehearsing and memorising a 40-45 minute original piece with music and dance is still a tall order. In the first meeting I don’t remember playing my cello at all! We did some movement warmups and then talked a lot about how we envisaged the project being created. Louise and Gemma have great experience in this area, having done this before, but not such a long piece and not with a live musician. So it was pretty new to all of us. We talked about what we each could bring to the project; what we found inspiring, moving or challenging, strengths and weaknesses. It was, if you like, an exploration of each other. I particularly loved this aspect of the project. Everyone had a say and all ideas were laid out for everyone to think about. No one was ignored and everyone mattered. That was the way the decision-making unfolded for the whole project which was important for incorporating the members with learning difficulties. The pattern of each rehearsal always started with our warm up dance which was led by Louise. By the end we knew it pretty well, but took time to learn, moving our bodies in ways which were unfamiliar to some (especially me!). ‘Hand in back pocket to R, look in the mirror to L, comb your hair to R, sweep to the green dancer, sweep to the red door, turn on the spot and repeat’. It was very liberating for me to be moving like this surrounded by others doing the same. Once warm ups had finished we then got onto our workshops, hoping to forge scenarios to build the piece. Multiple ideas emerged. Each of us created a movement based on our names, one of the main building blocks of the piece. Gemma asked people to bring holiday snaps from somewhere where they had felt very happy. From these, smaller groups working on dance fragments based on these memories. The results yielded embryonic material for inclusion – dancing with friends, boys building and selfies from New York. Vicky worked a lot on contact between people; starting with just looking then using touch, finally leaning and balancing using weight and resistance. Gemma had brought cardboard stools which you could sit, stand on and carry. These were included in nearly every part of the dance. 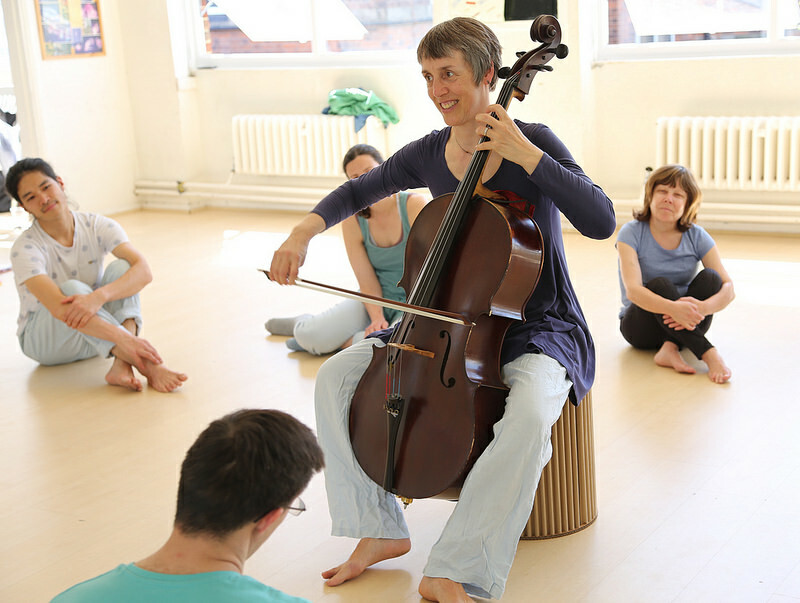 I actually sat on one to play without a spike so I could move around the space which I did a lot as the piece evolved. And I started playing, at first just improvising and mirroring the moves I saw before me, but then later adding some music of my own and also fragments of music by Walton, Britten, Bach and a well-known song from The Wizard of Oz! We inserted a music workshop session where we talked about music form and decided that our piece would be in sonata form with a first and second idea, a development section and then a repeat of the first and second idea with a possible coda. Graphic scores were drawn while I played. Takeshi, who was also great at warmups, taught us all a Japanese folk dance with very complicated movements. We all decided it should be included. Somewhere near the beginning of the process we decided the piece should be performed in the round. Gemma wrote poetry inspired by our work and those were added in the mix, recorded by Sorrel. Louise did a fantastic job of corralling and ordering our ideas, constantly asking questions about everything, challenging us to explain and justify – how did we feel this fitted in? Where should we position it? How did you feel that went? Was the music suitable? The first 3 consecutive days of rehearsal were so rich and fulfilling, I looked forward to absolutely every day. A big roll of paper with our plan on it rapidly became covered in coloured stickies as ideas poured out from everywhere. By the end of those 3 days we had already created 20 minutes of <Insert Title Here>. Let me explain about the title. Anna Arthur (Director of Croydonites Festival where we did our first performance) and Gemma wanted to include the audience in our piece so Gemma suggested it would be a nice idea to get the audience to name our piece after they had seen it. Answers on a postcard kind of thing. This then morphed into naming sections of the piece throughout, prompted by playing the music from Tony Hart’s Take Hart gallery music. Remember? Each further day of rehearsal and more building blocks were put in place with more fine tuning of each little section; focussing everyone’s mind into the piece to create spectacle, variation and interest in each moment. There were solos from James and Kirsty and Isobel led what we called Dynamic Mass Shape. A new section in the middle featured a septet of Vicky, Sorrel, Takeshi, Kumi, Kirsty, Fifi and me. Jack moved offstage using the cardboard stools like stepping stones. A disco breakout in the middle provided a moment of freedom for us all. Especially Izzy who joined in with Michael Jackson at the top of her voice! I put my cello down and from the floor was rolled across the space back to my cello with great intent and precision by Fifi. Sorrel and Takeshi danced to a Bach suite. There were challenges along the way. The fragile health of some meant missed time, and venue changes (from our rehearsal space at Croydon Youth Theatre to Braithwaite Hall, Croydon) caused consternation for some who prefer routine. Also some people needed more space to express themselves which occasionally meant decisions were made in more of a hurry than was comfortable. But every challenge was met with compassion and care, everyone was made as comfortable as they could be, no one got left behind. It really was a blueprint for how the whole world should work. The day of evaluation was also a revelation, I had no idea reporting on a project could be so enjoyable and inspiring. It was our chance to say how much we LOVED being part of the project. Finally the two performances. 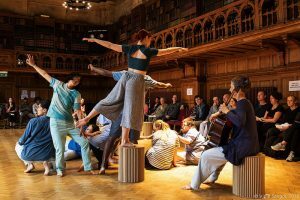 Performance number one in the extraordinary oak-panelled, book-lined Braithwaite Hall for the Croydonites Festival. A fantastic sold out audience of about 80-90 people sitting entirely around us. We performed, the audience watched. Through the twittering huddle of the beginning, through the dynamic mass shapes, Sorrel and Noelle’s duet, the septet, the disco, boys’ building to the final Japanese folk dance. I could see people really concentrating and watching each little section, wondering what they were making of it. The ‘insert title’ sections were very popular; each person writing their suggestion and each being read out. It was incredibly moving to see the concentration and creativity of each performer and when we had finished I felt so proud of what we had all achieved. There was a massive sense of joy within the group which communicated itself to the audience. The title we chose from the many suggested from the first performance was Ships and Walls: Where Old Memories Fall. The second performance (at St John’s Upper Norwood) was over a month later so we had a few sessions to remind ourselves of the piece. Gemma’s one little suggestion during those rehearsals was ‘take your time with everything’. It made such an amazing difference to the performance and there was a greater depth and even more space and time for reflection. Louise loved that the arches and high ceilings of the church framed sections of the dance like a picture. Both spaces affected the performance in different ways. The second title suggested from the myriad postcards was Held: The Ways We Can Be Together. This was one of the most inspirational and moving projects I have been involved in. The care and compassion expressed between the members of the group was ever present. Everyone mattered. All ideas were valid, everyone listened and watched, learned and took note. Mums, Dads, partners and support workers who came to rehearsals commented on the wonderful atmosphere surrounding the project and said how valuable it was for the dancers to be involved in something this creatively important. I was honoured to be part of it. Let’s dance on our chairs, around them and on them. Fly on them and put them up our jumpers. Let’s laugh and cry together, feel joy and sadness. But repair and rebuild each other, nurture and take care. Let’s be anxious together but know that we have to do this. The only option is this.